Not so long ago, I wrote about a handy Add-On for Google Drive called Speech Recognition, here. It allows the user to talk into the microphone and have their words transcribed. 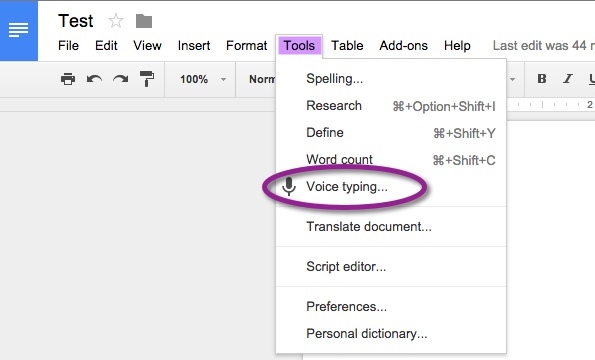 Google has now incorporated Voice Typing in their Tools Menu, which does the same thing! A microphone icon will appear on the side of the d ocument. Click it. 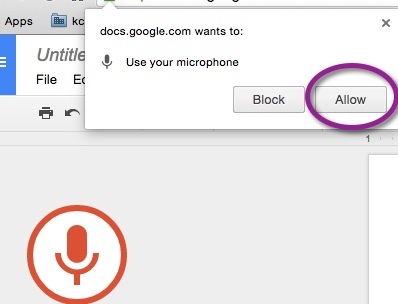 The first time you use this feature, you will be prompted to allow Google Docs to use your microphone. Choose allow and start talking. This entry was posted in Google, google docs and tagged Google, Google Docs by Admin. Bookmark the permalink. Lisa….I do not see voice typing in my tools drop down. If you’re using your GAfE (school) account, it may be on a delayed release. Give it a week or two. It will depend on what the Administrator of the Acct. set it up for. If it’s your personal, it may not have updated yet. Give it a day or two.